The Jewish Art Salon is partnering with the Brooklyn Jewish Art Gallery at CKI, Brooklyn, NY. In conjunction with Jewish Comic Con, Brooklyn, NY. 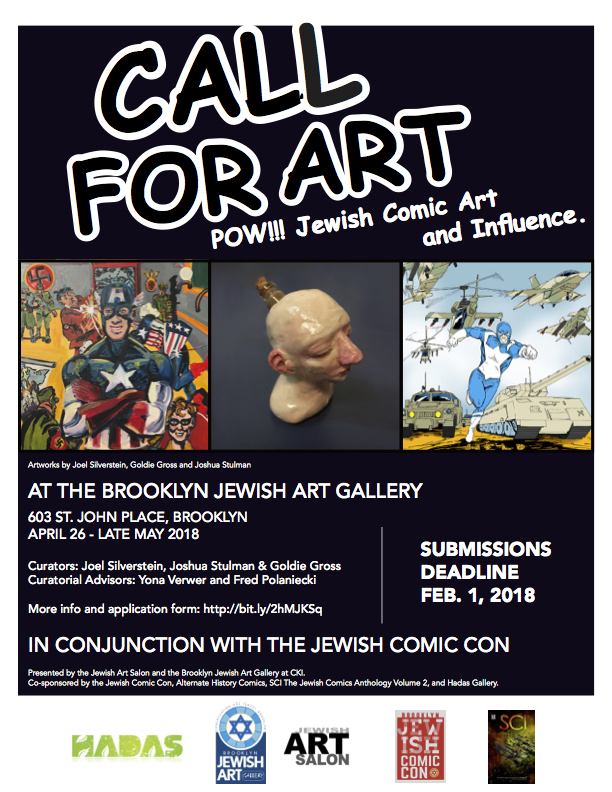 The Jewish Art Salon is accepting submissions for POW!!! Jewish Comic Art and Influence, which will kick off (and run in conjunction with) Jewish Comic Con, the first ever event of its kind. The Jewish Comic Con, in its second year, explores how Jewish identity has influenced comics, both on the page and behind the scenes. But it isn’t just for the “members of the Tribe”. It’s for everyone. It’s a love letter to the creators of the comic book medium and their heroes! This exhibition entails two distinct types of comics-related art: Comics based on Jewish content (including all manner of cultural, historical, and religious experiences in and out of the commercial publishing world), and “fine” artworks (such as paintings, collages and prints) inspired by comic books as subject matter, both in form and content. The more unique and personal, the better! Exhibition opening reception April 26, 2018. + Panel discussion with Simcha Weinstein, Joel Silverstein and others TBA. Exhibit on view until late May. Eligibility: Anyone, but Jewish Art Salon members will get preference. Size: Max. 48 inches wide. Prefer smaller book or poster sized works, but will look at larger gallery sized pieces also. Joel Silverstein is an artist/curator and art writer. He has written over 60 articles about art and has exhibited at Columbia University, Pratt Institute and the Van Leer Institute Jerusalem. He is Founding Member of The Jewish Art Salon, for whom he has curated many exhibitions including The Dura Europos Project and JOMIX; Jewish Comics: Art & Derivation, at the UJA – NY, the Philadelphia Museum of Jewish Art and the Jacobson JCC in Roslyn, NY. He was chosen for the Jerusalem Bienniale 2015, and 2017 and is included in Ori Z. Soltes’ book, Tradition and Transformation; Three Millennia of Jewish Art & Architecture, MaKom Press, 2016. Transportation: Artists are responsible for round-trip mailing or drop off and pick-up of their artwork. Submit up to 3 images that accurately represent the theme. Save images as lastname.title.jpeg If the submission file of artwork isn’t saved as requested, the work will not be considered. The deadline for submissions Feb 1, 2018. Jewish Art Salon members will get priority over non-members for selection. You can sign up on Submittable. If you join as a new member through Submittable, email jewishartsalon@gmail.com and we will refund your $7 submission fee.